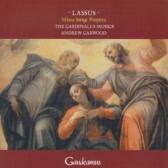 Lassus is well known as a composer whose imagination was fired by the texts that he set. For that reason, grouping together all of his motets which use the Song of Songs (Canticum canticorum) provides an excellent set of compostions. Lassus is obviously stirred by the sensual texts, concerned with the expression of human love in a spiritual context. The disc also contains the sweeping and sonorous Missa Surge propera and an eight-part Magnificat on the fourth tone.